The Standard Chartered Marathon is just this Sunday!! Have not been training much this year and it's a little late now but what I can do is to pump more carbo into my body. Hehe. A carbo-freak like me always welcomes carbo-loading! Brings to mind a meal at Gayatri Restaurant just before the exams. The Fish Head Curry ($20) was a fleshy snapper head in a mild curry that leaned towards tangy. Perhaps it was the assam. This made it a bit of a cross between curry and assam fish head. But the tangyness certainly was a good appetite stimuator! I had the Briyani Rice with Pappadum and two vegetables of the day (a spicy-sourish eggplant and stewed snake gourd with lentils). At $4, these were eat-as-much-as-you-want! What I like about the Briyani here was the rice. The grains were beautifully long and had a nice soft-firm texture. The spices like cloves, cardamom and star anise, were a little more subtle and delicate here. I think this is good as it allows one to taste the flavours of other dishes. Speaking of other dishes, we also shared a Chicken Tikka ($6). These took a bit of time to arrive so it would be good to order this the very minute you step in. But they are worth the wait! Succulent pieces of chicken were marinated in yogurt and spices before being grilled. The smokey flavour was simply alluring. And for those who prefer a lighter carbs choice, there's always the Dosa (aka Thosai). Here's the Plain Dosa ($2)- crisp outside and just a bit chewy, accompanied by three sauces. Yums. Chew On This: Enjoy the Fish Head Curry at a special price of $15 every Monday and Wednesday! The past few days have seen chilly mornings and rain that seem to go on and on. This must be a sure sign that roast turkey Christmas is coming. It doesn't snow in Singapore but we sure have rain. Lots of it as the year-end arrives. But looking past the downsides of the downpour (think getting wet, laundry not drying, having to wake up in mornings that had perfect weather for sleeping in etc), there are good things that happen too. There's no need to water the plants, saving both water and effort. There's no need to switch on the air-con at night, saving money. But my favourite was stumbling upon a good plate of Hor Fun at this nondescript stall in Alexandra Village Food Centre. It was after an average fish soup dinner that I was prepared to pick the car up at a near-by workshop. Then it started raining. The rain totally delayed my plans. So I decided to order a plate of Hor Fun while waiting for the rain to stop. What's a foodie got to do while killing time at a hawker centre? The Fish Hor Fun ($4) comprised of well-fried flat rice noodles doused in a light starchy gravy with prawns, sotong, fish slices and cai xin. To me, the vital component in Hor Fun is the noodles. Here, it hits the spot with a good chewy bite and with an intense smokiness that resulted from frying the noodles quickly over a really hot wok. Some dark soy sauce is used to add colour and flavour. The sotong was tender and fresh while the prawns were flavourful though over-cooked. The fish used was Toman (aka Snakehead), not exactly my favourite fish but people do like it for its firm texture. Thankfully, there wasn't any of that muddy taste that sometimes plague this fish. The light starchy gravy wasn't too gummy or starchy and coated each sliver of the rice noodles and the other ingredients perfectly. This made each slurp and bite really smooth. This is one good Hor Fun, rain or shine. Thank God for the rain that evening. Chew On This: During my 30-minute Hor Fun bliss, I realised that 85% of the orders made at this cze char stall seemed to be for the Hor Fun and its Bee Hoon alternative. Time for a return to check out the Bee Hoon! Since the exams are just less than a week away, I shall put some genetics term to use here. ori refers to the origin of replication in genetics. But its definition can also be used for this Katong Laksa stall- The Original Katong Laksa. The original Katong Laksa stall? Apparently yes though there are many disputes on the true original Katong Laksa. The popularity of Katong Laksa led to the establishment of at least three or four stalls in the same vicinity all trying to replicate the original's success. One was a former helper at this stall while the another is a family relative. And as seen on Makansutra Raw, the owners of these stalls are not exactly on friendly terms. Laksa wars aside, I did enjoy the bowl of Katong Laksa ($3) here. The bowl contained the standard fishcake, beansprouts, prawns and thick bee hoon, topped with shredded Laksa leaves (Daun Kesom) and a dollop of chilli. What stood out was the gravy and chilli. The aromatic gravy had lots of coconut milk that gave it a creamy mouth feel. In addition, it also had this subtle sweet taste to it. A sweetness that I would relate to seafood. But the gravy alone seemed to be lacking in something. That was solved when the chilli was stirred in. The chilli added oomph! Oomph. Just what I need for the exam period now. Chew On This: Katong Laksa is eaten with a spoon to save the stall-owner costs on chopsticks as the bee hoon has been snipped into short strands. After last week's 938LIVE lunch recommendation at a hospital, this week's is at a prison. Ok, maybe more accurately, at the outskirts of Changi Prison. This cow stays near-by but has never tried this place until now when Dad suggested it. Bark's Specialty Chicken Wings ($10.90 for 6) were a good thing to start off with. They weren't very tasty on their own but some chili sauce and mustard did the trick. What was worth noting was that they were well-fried- hot! not too oily! crispy battered skin! Dad picked the Char-Grilled Tenderloin Steak ($22.90). I think calling it 'char-grilled' is a misnomer. Anyway, the steak was a bit chewy and it turned out to be a good thing as it became more flavourful with each chew. My Cheesy Hamburger ($13.90) had a moist beef patty with a mild beefy taste. I like the bits of black pepper in it. The fried egg's runny yolk also added a rich, thick layer of pleasure to each bite. While not outstanding, it was good. The Bark Cafe has a very relaxing feel to it. Maybe it's the lush greenery and grassy slopes. Or the fact that it's at a fairly off-beat location. Or being neighbour with the Changi Museum brings a sense of history. Whatever it is, I like the feel of this place. There's an ash tray on a barrel outside the dining area. I think it's the smoking point. But don't smoke la. The air and surroundings are nice! Here's a big Happy 50th to Auntie Petrina (not my real auntie but Jasmine's mum)!! Got invited to her place together with the League and was really amused at her enthusiasm for Halloween decor. I mean it's not like she has been living for many years in the US. 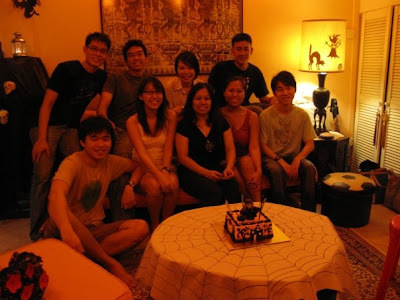 Halloween is not exactly part of Singaporean culture (ok, except maybe clubbing in costumes/outfits) but most don't decorate their homes with ghosts, coffin, skeletons, orange lighting, pseudo-cob webs, witch candy bowl, plastic spiders in the snack bowl etc etc. But I am glad she had so much fun! Guess the skeleton is out of the closet. There wasn't any ghoulish dress-ups nor trick-or-treating but the catered food, no matter how un-Halloween, was a treat, especially the laksa. Laska is the perfect rainy Halloween party food! Hahaha. Chew On This: According to her husband, Auntie Petrina is a cake hantu! 'C' is for Cake!